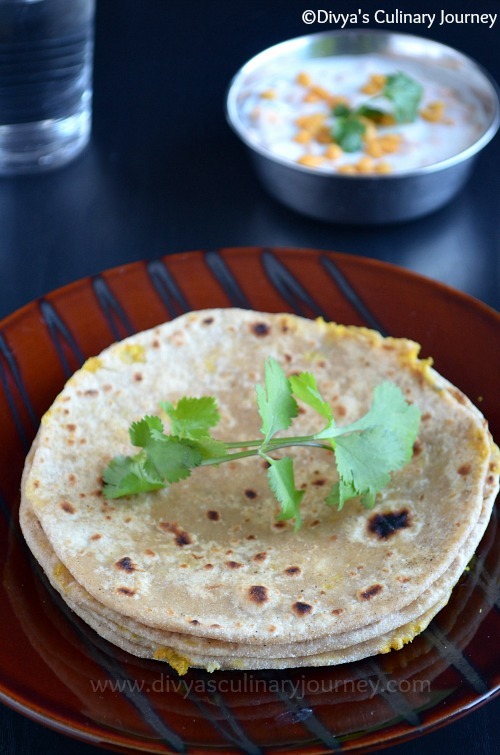 Today I am posting here the recipe for Gobi Paratha or Cauliflower Paratha. Gobi Paratha is the Indian flatbread (paratha) stuffed with spicy cauliflower stuffing. 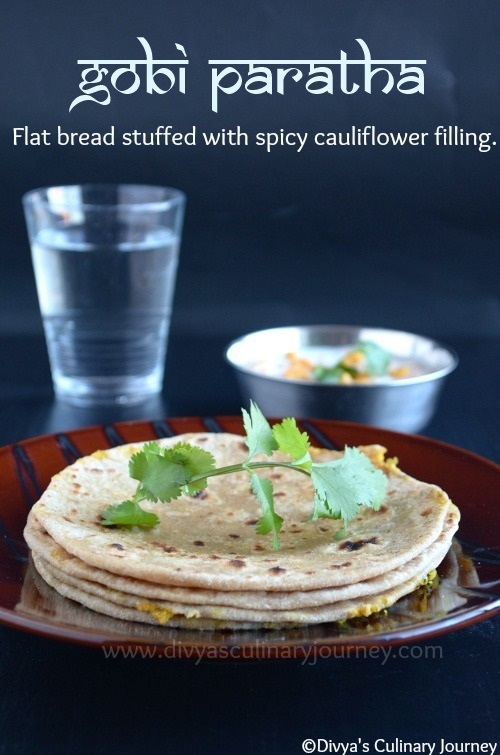 The paratha is made out of whole wheat flour and cauliflower stuffing makes it a wholesome dish. Cauliflower is known as gobi or phool gobi. My kids never complain to eat vegetables when they are stuffed in parathas. I served these gobi parathas with boondi raitha. In a bowl, combine wheat flour, oil and salt and add water little by little and keep kneading till smooth dough is formed. Then cover the dough with a wet cloth and let it aside for at least half an hour. Heat oil in a skillet, add cumin seeds and fry for a minute. Then add the ginger garlic paste, turmeric powder, chilli powder and fry for a minute. Then to this add cauliflower and required salt and saute in low heat till it is cooked. Add chopped cilantro, mix well and turn off the heat. Wait till the mixture cools down. Knead the dough well. Divide them into about 10 equal sized balls. Take a ball, dust it with flour, slightly roll it out and place the filling in the middle, pull the edges together and seal them and dust more flour and roll them again gently into a flat disc. Take care that the stuffing doesn't come out. Heat the tawa / griddle and cook the parathas on both sides drizzling required oil. Repeat the process for the rest of the dough balls. Serve parathas warm with raitha or pickle or any other dish of your choice. Depending on the amount of stuffing used, there may be leftover filling after making parathas. You can make more parathas or use them for stuffing sandwiches too. I wanted these parathas to be vegan, so used oil for cooking. If you are not particular about vegan, then you can use ghee (clarified butter) for cooking the parathas instead of oil for extra flavor. 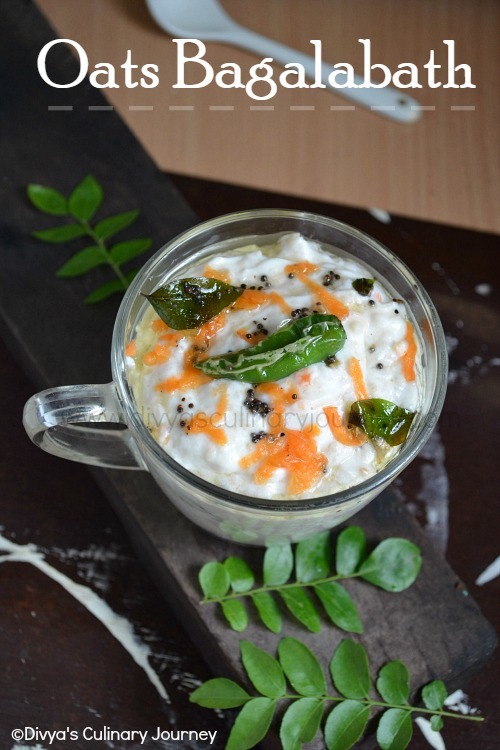 For vegan meal, you can avoid serving it with raitha and serve it with any other vegan side dish. 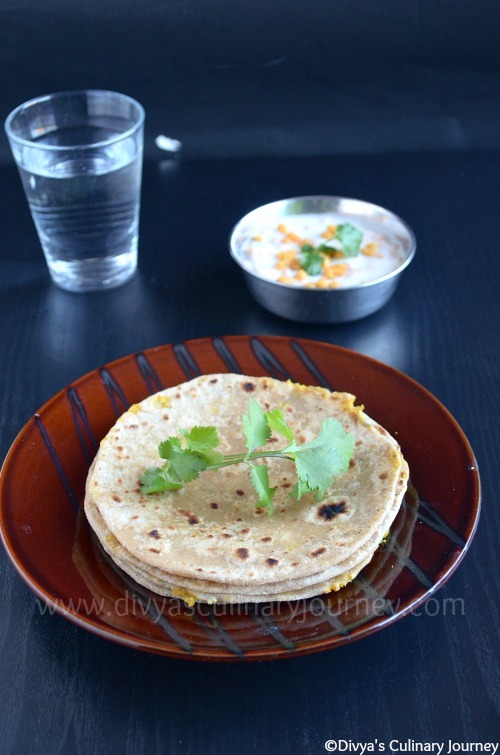 If interested do check out the other stuffed paratha I have posted already- Carrot Paratha. Easy to make Tasty Parathas. Looks and tastes good with your wonderful photography. wow such an delicious paratha , so perfectly made and love the filling in it !! very inviting !! One of my favorites, yummy parathas and love the first click.. Absolutely delicious gobi paratha, love it as it is not oily. Delicious stuffed paratha, healthy too dear !! Seasonal and wholesome meal. Love gobi parathas. looks yummy...happy to follow you..